So far, the growing crisis in Iraq has not drawn strong interest from the American public. As Sunni militants extend their control of large swaths of Iraq, 25% say they are paying very close attention to the growing violence and political instability in Iraq. By comparison, 28% of Americans surveyed June 26-29 say they followed news about problems with care at veterans’ hospitals very closely and 21% paid very close attention to news about the IRS losing employee emails. Young people typically express lower levels of interest in news stories than older Americans, and the age differences are striking when it comes to Washington news and violence in Iraq. Just 13% of those younger than 30, and 19% of those 30-49, say they tracked news about Iraq very closely. That compares with 36% of those 65 and older and 34% of those 50 to 64. However, the World Cup is a different story. About a quarter (24%) of those under 30 say they are closely following the World Cup – making it by far the story they express the most interest in. 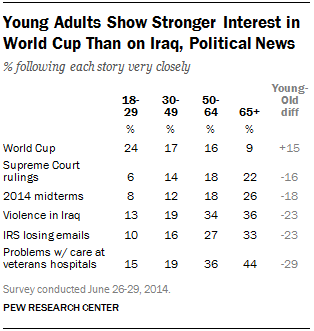 Young people are more likely than older age groups to be closely following the World Cup. 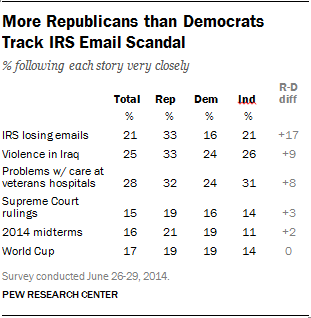 There also are partisan differences in interest in the week’s news stories, particularly reports about the lost IRS emails. A third of Republicans (33%) are closely following news about lost IRS emails related to the targeting of certain political groups for scrutiny. Republicans are as interested in the IRS developments as in Iraq (33%) or in the troubles at the Department of Veterans Affairs (32%). By contrast, just 16% of Democrats say they closely followed the IRS story, the lowest level of interest Democrats expressed in any of the week’s news stories (tying with Supreme Court rulings). 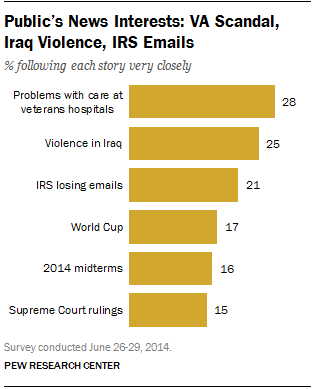 Problems with care at veterans’ hospitals (24%) and violence in Iraq (24%) were the top stories for Democrats. Interest in the World Cup is also relatively high among Hispanics. Overall, 23% of U.S. Hispanics say they are following the soccer tournament very closely while another 32% are following fairly closely. Whites and blacks are not particularly interested in the World Cup, with majorities saying they are following not too or not at all closely. See the full topline results and research methodology.